Plush Animals and Plush Dolls, all of them Animated! 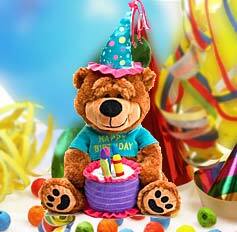 Singing Birthday Teddy Bears, cute and cuddly Animated Dolls to send a get well wish or just to cheer someone up. We offer a variety of Plush Animated Gifts sure to put a smile on the face of anyone that receives one of our Plush Gift Packages! included with all of our Plush Gift Packages!